Daily Market Trend Guide -- One of India's most accurate and highly acclaimed Daily Market Trend Guide which brings an in-depth technical analysis of Indian Equity Markets every morning before the Market Opens in your mailbox. Gemstone Equity Research & Advisory Services offer Premium and PERSONALIZED Stock Market Advice. Indian Equity Markets had a dismal session on Friday. While decoupling from the global markets for all the wrong reasons, the NIFTY came off 178-points from the high point of the day to end the day with a net loss of 93.20 points or 0.88%. Looking from a technical view point, the NIFTY failed to sustained itself above 50-dMA which stands at 10590. On the other hand the Index also drifted below the 10480-10500 support zones. Monday's opening will be crucial for the Markets. 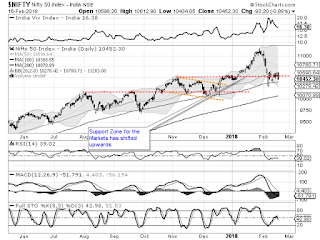 Global markets have been stable and if we see NIFTY sailing past the 10500-mark on Monday, we will see the Index bank into the trading range. However, failure to move past 10500-mark will mean increased possibilities of the NIFTY testing its 100-DMA which stand at 10388. Monday will see the levels of 10500 and 10565 will see themselves playing out as immediate resistance levels for the Markets. Supports come in at 10430 and 10385 zones. The Relative Strength Index – RSI on the Daily Chart is 39.0182. It shows a Bullish Divergence as while NIFTY formed a fresh 14-period low, the RSI did not. The Daily MACD too is seen narrowing its trajectory while trading below its signal line. Engulfing Bearish pattern has emerged on Candles. Since it has emerged during an downtrend, it can potentially mark a temporary bottom. However, this formation cannot be read in isolation and it requires confirmation on the following day. While having a look at pattern analysis it is a matter of concern that the 50-DMA levels have proved to be resistance levels for the Markets. Also, the support zone of 10480-10500 has been compromised to some extent on Friday. The damage that we saw on Friday was more of sentimental in nature. With global picture in place and stability prevailing in the global markets, we do not see NIFTY breaching the 100-DMA mark as easily as significant shorts is seen in the system. Also we enter the expiry week beginning Monday and some short covering can be expected if the NIFTY does not breach the 100-DMA mark. We would still recommend avoiding shorts, preserving liquidity and holding only modest exposures until a confirmed bottom is formed. Stock specific out-performances are likely to continue. Resilient technical set up is seen in stocks like JSW STEEL, CG POWER, INFOSYS, BHARAT PETROLEUM, BIOCON, ACC, NATCO PHARMA, EMAMI LIMITED, M M FORGINGS, JP ASSOCIAT, VEDANTA and WANBURY. MyMoneyPlant.co.in. Awesome Inc. theme. Powered by Blogger.